To 1980 born Smitha, writing is not just a hobby but a way of life. She lives poetry, breathes poetry and writes poetry. Though she writes other forms too, poetry is her first and lasting love. Fun loving and vivacious, Smitha has been writing ever since she could hold a pen and her first poem to be published was when she was seven. Her works can be found in various websites such as poetry.com, allpoetry.com, simplyhaiku.com etc. Her poems are selected for inclusion in international anthologies. 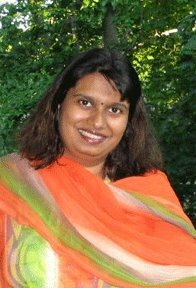 Smitha lives in Philadelphia and works as a techno-marketeer. Her passions lie in exploring various layers and adaptations of beauty and capturing them in a canvas of choice, be it a haiku, a sonnet or even a digital camera. A lot of content by Smitha is published on this site under maiden name of "Smitha V".